This is a story about how much I love my family and what I am able to do for them. Long story short: After a long and tiring journey without a sleep for 33 hours I found myself in crazy circumstances – I walked into my house through the window. I wanted to stay for Christmas in Tallinn, but finally I decided to go home and surprise my family. That time, in a warm and comfortable room I thought it was a great idea. Well, after couple of hours I had second thoughts… But let me start from the very beginning. My expectations: bus trip for 16 hours, one hour break, then change to a train for 6 hours, than another train trip for 30 min and a walk (2 km – nothing, right?) to my uncle house. Knocking to his door and enjoying his happiness after seeing me. Resting all night. Visiting parents in the next day. Easy as that. In Estonia everything went smoothly. I just needed to re-book my ticket from 6.30 am to 2 pm bus. It facilitates the connection between bus and a train I was supposed to catch later. After I crossed Polish-Lithuanian border it started to snow so there was a delay of arrival to Warsaw. I missed the train obviously. I took into consideration all circumstances (Polish realities and the wintertime) to think about the best solution. It seemed reasonable to take a direct train to Opole or Brzeg so that I didn’t have to freeze at the stations. For the next train I waited four and a half hours. Silly as I am I didn’t even bother myself to check the weather in Poland. I assumed it’s much warmer there than in Estonia. How wrong I was. I didn’t prepare myself for that. I really considered drinking beers to warm myself up, even it’s only an illusion of warmth. I know myself so well, after one sip I would fall asleep immediately. I needed to stay focused or at least awaked. After 5 hours of sleeping I was awake for 21 hours, so I was pretty tired, especially when I thought about the next couple of hours without a sleep. A blessing in disguise I found a working heater in a waiting room and I almost hugged it. It became my friend. I was checking the clock from time to time and I realized it’s my enemy for a change. Damn you, Time! Why do you run when I need you to stop and stop when I need you to run fast? Anyway… I tried to find any undemanding activity to kill time. I read a book for a while but I didn’t really help. It made me sleepy actually. Then I paid my attention to the people in the line. I heard what tickets they needed, where they were going and how much they paid and what platforms they were looking for. After some time I was able to answer all their questions. I could easily replace the lady who worked in a Information Office. It bored me, too. Then I focused on pigeons. (Something is wrong with my interest in pigeons lately). I didn’t register too many noticeable events: one footless pigeon, one poo – not much really happened. While “admiring” the pigeons I looked at the ceiling. It simply hung there and threatened to fall down. An interesting observation about homeless people: Most of us are afraid of them, but they are more afraid of our intentions. They keep their bags so tight as if somebody wanted to steal it from them. I don’t think they have any valuable things there, but well… it’s all they have. And the discussions between them are simply hilarious. They consist mainly swears, but that only gives an emotional character to the speech. In a magical way I had one hour left to start my trip again. In my head I counted how much time it takes to transport my heavy bag down stairs and up stairs to the right platform. Fortunately there was always a nice gentleman to help me to carry my bag. No wonder why… I had to look pitiful pulling the bag up the stairs (this direction is much more demanding for me). Probably he saw my misery and had a mercy on me. I had a nice chat with him. In 3 minutes he told me the story of his life. Amazing person. He defeated the cancer and now he lives his life to the fullest. Every time I meet an inspiring person I am truly amazed and it changes my life somehow. I am really lucky if it comes to meeting wonderful individuals. Or this is only my attitude toward people and I can find all good features in them. I believe it’s both. The time to go home had come. I expected train to be full because of the coming Christmas, but it was almost empty. I met a very nice couple which helped my with my bag. People here are always so helpful and kind. In Częstochowa I had all free places for myself. I could get some nap, but I was too tired to go to sleep. Silly, but true. After a few hours I saw my sister waiting for me at the station. Finally! She took my bag and took it to the car. I hide myself behind the tress to surprise my uncle who thought he is here to take a package that my sister need to pick up. Yeah, he was surprised! After a moment of joy and happiness we went to my parents’ house. My uncle and my sister went to the kitchen to hold my parents there so that I could walk into a house unnoticed. I walked there through the window and sat down on the couch in the living room as if nothing had happened. Then my parents walked into the room and stood still for a few seconds. They didn’t know what’s going on. They were so happy! In that moment I saw in their eyes the whole trip was worth it! After one month of my incredible care and attention he became quite decent plant. Within a few days I will go home. I haven’t been missing it much, but since I’ve made that decision I am already packed. I can’t focus anymore; all I think about is that journey home. To make my big arrival more dramatic and exciting I didn’t tell my parents I am coming. Moreover, I lied! Only my sister knows about my evil plan. I know my family misses me so much. That is really sweet and melts my heart. Despite the fact I am tough, I am sure I’ll burst into tears when I see my mom. She’s always so worried about me. You know how it works: you can never stop being a child for your mom. I’d love to make a surprise but I have second thoughts. I mean, I don’t want my mom to have a heart attack… Well, she’s my mom, she’ll survive. The last days of this year made me sentimental, but not mawkish. However I would like to sum up past quarter of my stay in Tallinn.I wish I could keep all my memories unchanged. They are one of only few priceless things in my life. I will remember people and places more readily if they relate to fragrances or sounds. Now, I am not sure if I like below songs because it’s really good piece of music or because I use to listen to them here. Let me introduce Lana Del Ray. I’ve heard about her for the first time when I came here and since that time I listen to her songs too often. As you could notice I also enjoy “wasting” time watching sitcoms and other TV shows. 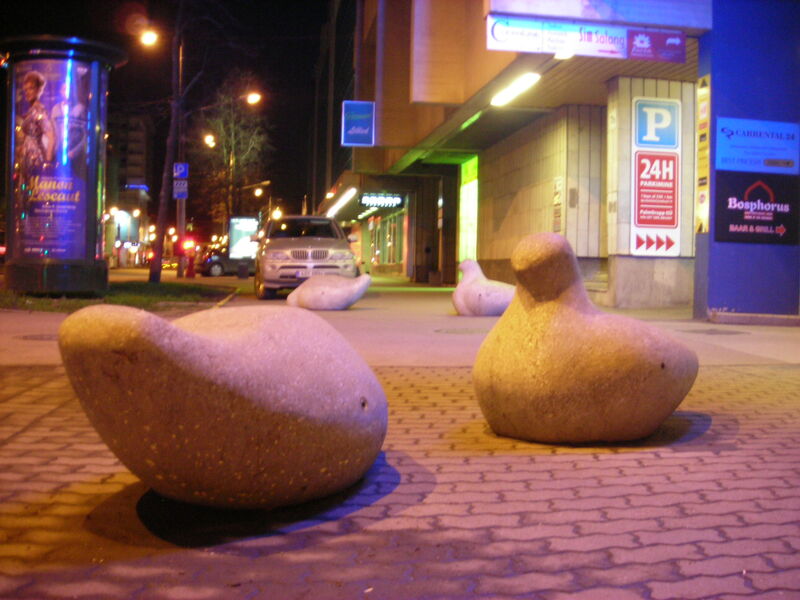 Besides visual catalysts of memories also other factors will bring Tallinn to my mind. ♣ Ciders – drinking acquired a new meaning for me! ♣ Special flavoring for dumplings – well, it’s a kind of universal spice, great for french fries too. ♣ Pomegranates – cheap and delicious. Colors of Tallinn’s flag are: blue, black and white. They are strongly connected to the weather in winter, believe me. But for me Tallinn’s colors refer to Polish flag: red and white. Red roofs of Old Town buildings and white bricks (later about them). 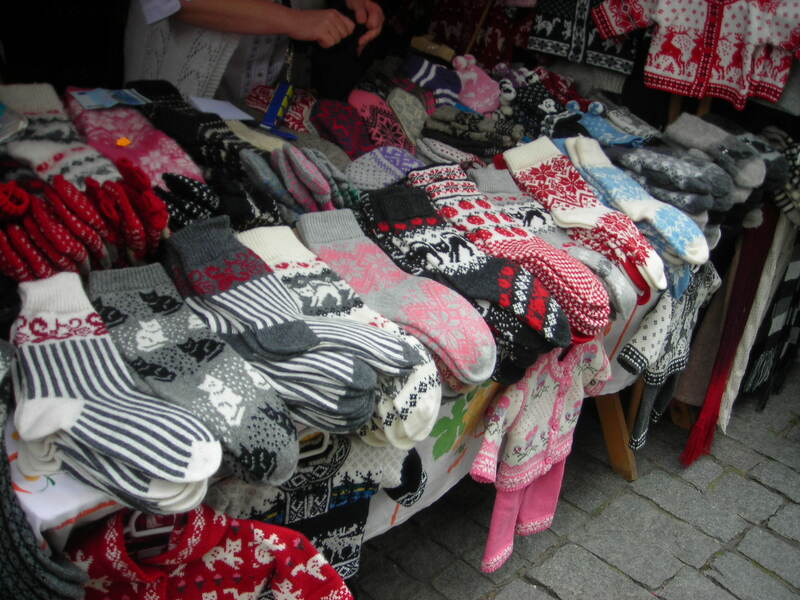 And of course famous Estonian patterns. But getting back to more prosaic topic… For the first 3 weeks I’ve been cleaning mainly. I’m not complaining – I liked it. It was like therapy, calmed me down. Don’t get me wrong, but I feel fantastic when I can smell Mr. Muscle (Lemon Fresh) or Ajax Baking Soda (Orange-Lemon Fragrance). Oh, good memories! A few days ago I couldn’t fall asleep. Usually I go to bed rather late, I’m a night owl. It was impossible to get some rest that night. I had a crisis at 7 am, no sleep though. I had no other choice than just be awake until the next evening. With that amount of time what can you do? 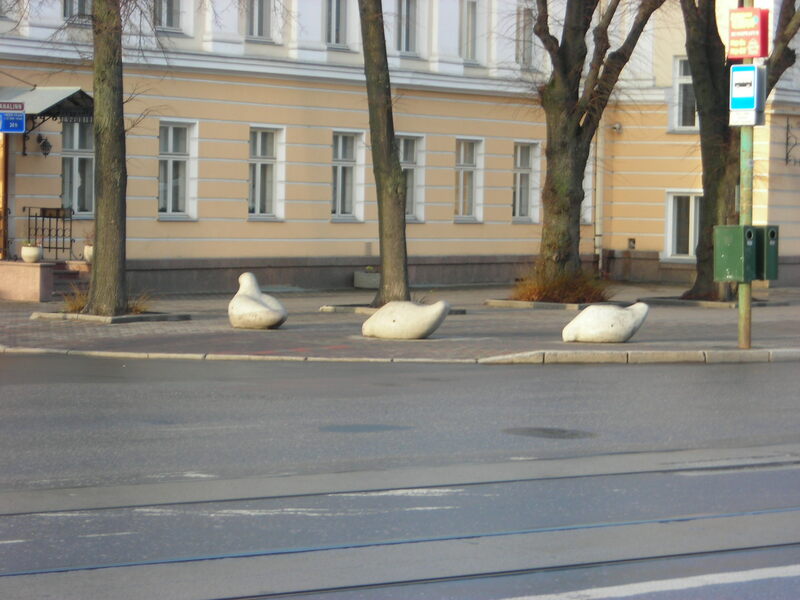 I went to the city center to find all fat pigeons. And I think I managed to find most if not all of them. For a while I’ve been thinking it was a dream or a mirage. But my camera says it’s true. To prove it to you I’ll show you the photos. Let’s count the fat pigeons. Jeez, I need to demonstrate the mathematical skills, which are limited (to say the least). For now we have 8 from 2 photos from previous post. Those saved my time. 1o sculptures in one place! (13+10= 23) I found them when I came back from the post office with Christmas cards. Sweeter couple (52+2=54) Oh, and worth to notice: next to them you can find a bench dedicated to Chopin! But hey, why was I so lucky? Oh, the day was perfect for a walk: excellent visibility, sun shining like it was spring, not winter, cup of hot coffee in my hands and the pigeons everywhere! And a small bonus in the end of the day: a snow! Ah, it made me really happy! First snow this year! Now I’m in the Christmas mood. The landscape has changed dramatically. It seems like my walk was the last glimpse of autumn. I made it just in time. I find this task as unfinished… Wait for me, pigeons!